A WW1 navy crew's daring secret mission to salvage 44 tonnes of gold bars worth £1.3 billion from the wreck of a ship sunk during the First World War is revealed in a new book. 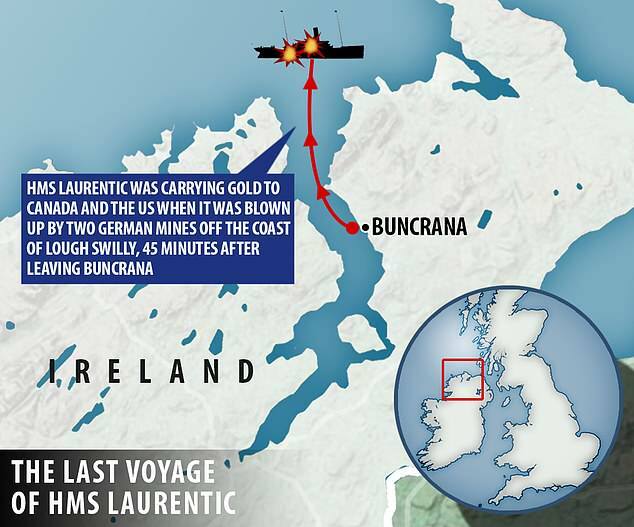 HMS Laurentic was carrying the gold to Canada and the US when it was blown up by two German mines off the coast of Lough Swilly, Ireland on January 25, 1917. The merchant cruiser sank within an hour, resulting in the deaths of 354 out of 479 passengers on board. Cash-strapped Britain needed the gold to finance its war effort and put together an elite diving team to retrieve it from the shipwreck which lay on the seabed at a depth of 130ft. The operation started in 1917 and needed to be done in stealth because the British government could not afford for the Germans to learn about the gold in the wreck of the White Star Line ocean liner. The little-known salvage operation was headed up by the highly experienced Lieutenant Commander Guybon Damant. Over the next seven years, he was able to retrieve 3,186 of 3,211 gold ingots that went down with the ship, with a value of £5 million at the time. The recovery of the gold is to this day the largest recovery, in weight, of a sunken gold hoard. The extraordinary operation is revealed for the first time in unprecedented detail by historian Joseph A. Williams in his new book, Sunken Gold.